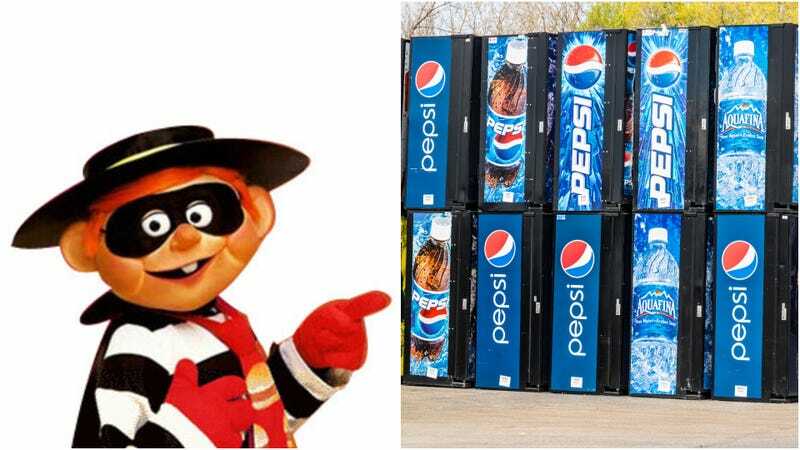 Sure, times are tough all over, but we’ve honestly never thought of a vending machine as something worth stealing. There’s gotta be what, like 10 dollars in change in there? And a limited amount of beverage cans? So for a variety of reasons, we don’t understand the methodology behind this particular crime, recently captured on a security video in Oklahoma City and featured in the New York Post. First, a guy with a bandana around his neck comes up to the vending machine and gets a soda, presumably a Pepsi. Then he warily looks around to see if anyone else is close by. Apparently not, because five minutes later what appears to be the same guy returns with a pal and a white pickup truck to take the entire vending machine. His bandana is pulled up now, but it doesn’t matter, because we’ve (probably) already seen him. Honestly, we can hardly imagine a less perfect crime. At least it looks like they covered up the license plate, for god’s sake. The Post video ends by saying that the police are still searching for the culprits, but with criminal masterminds like these, we suspect they’ll get caught pretty quickly.